Let’s hope that this time, it’s for real. 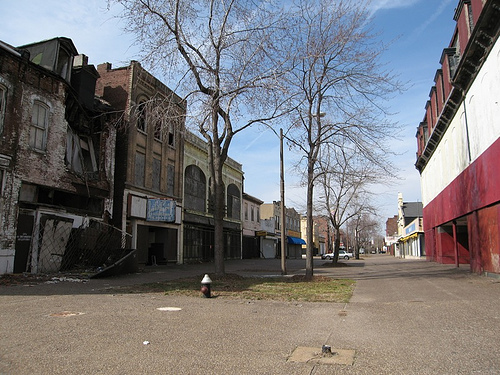 A recent visit to the two-block area in north St. Louis, known as the 14th Street Mall, revealed more redevelopment activity than has been seen in years. 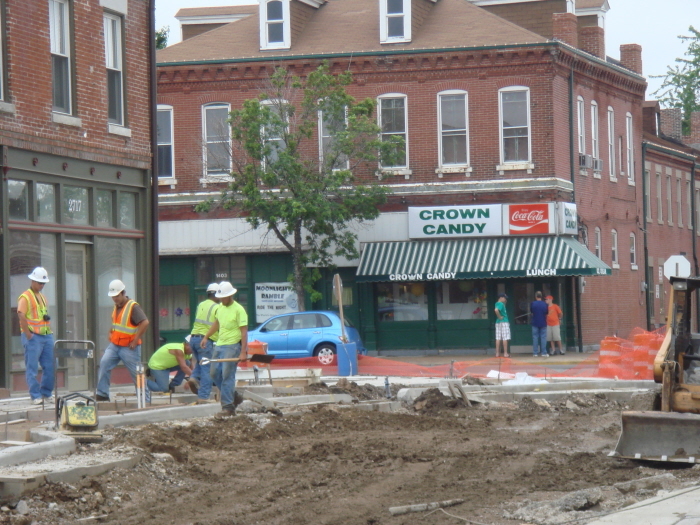 Earthmoving equipment was actually moving; workers were paving sidewalks; the early 1900’s-era storefronts, neglected for nearly 40 years, were models of before-and-after rehabilitation. New curtains in second-story windows and flower boxes at ground level offered convincing evidence of residential life. The improved view from Crown Candy Kitchen, just across the street, is dramatic and heartening. Just one year earlier, on my previous visit, development was at a standstill, and the promised completion “by the end of 2009,” didn’t materialize. The “mall” on 14th “street” was an absolute misnomer: neither a shopping area, nor a thoroughfare for cars. 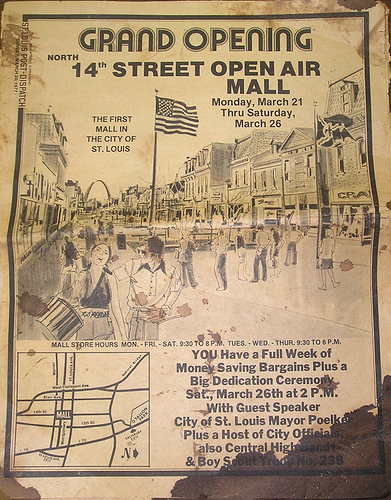 Grand opening, pedestrian mall: 1977cars. What seemed like a great idea to pedestrian-mall-happy urban planners of the 1970s apparently didn’t jibe with shoppers’ preferences: In the late 1970’s, open-air, strip shopping centers were being supplanted by enclosed malls, and shoppers flocked to them. Store owners, too, disliked the pedestrian-mall concept, as it eliminated drive-by traffic, thus drastically reducing vital street exposure. In recent years, new interest in historic preservation has brought rehabbers and urban pioneers back to the once thriving Old North area. Drive or walk around nearby blocks, and you’ll see the results: classic, turn-of-the-20th-Century brick homes meticulously restored; new, in-fill construction; community vegetable gardens and, of course, Crown Candy Kitchen, through it all a neighborhood anchor and enduring tourist attraction. And, on 14th Street itself, right in the middle of a block with no other functioning retail establishments, there’s “Head Hunters,” a barber shop whose owner has continuously served his customers at this location for the past 30 years. Down the street, a new dress shop, its name newly painted in gold on the front window, is ready to debut once street paving is completed. Will it work? Urban observers doubt that the 14th St. Mall will ever return to its early 20th Century glory days. And hopes in the area have been shattered many times. Today’s sluggish retail economy, tight money, and the huge odds facing new retail ventures will place enormous hurdles in the way. Local St. Louis politics, notorious for sabotaging change and innovation, will also play a role. But this time, at least from what I saw on June 9, 2010, the effort seems excruciatingly close to a chance for success. And I sincerely hope not to have to write another neighborhood-on-the-verge story about the 14th St. Mall again, one year from now.